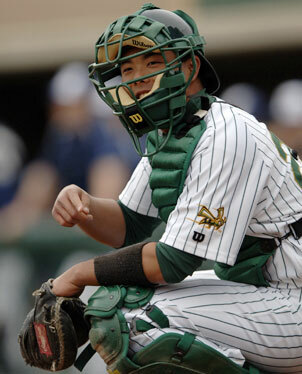 Catcher Brett Tanigawa, above, (Moanalua '03) and infielder Taylor Watanabe, below, (Aiea '03) have one last chance to win a college game on Oahu when Sacramento State and Hawaii begin a four-game series tonight. TWO former high school rivals are putting the final touches on their collegiate careers with one last visit back home in Hawaii. Taylor Watanabe (Aiea '03) and Brett Tanigawa (Moanalua '03) are fifth-year seniors at Sacramento State, which opens a four-game series against Hawaii tonight at Les Murakami Stadium. Since joining the Western Athletic Conference prior to the 2006 season, the Hornets have yet to win a game on Oahu. They were swept by the Rainbows in 2006 and didn't make the trip to Hawaii last year. With more family and friends in the crowd than either knows what to do with, both hope to stamp their final trip home with a couple of much-needed wins. "This weekend we're looking at bouncing back," Tanigawa said. "Especially in WAC play, every game is important. We're expecting to play our best." The Hornets have gotten the best of the 'Bows so far this year, sweeping four games in a series played in late March at their place. Most recently, the roles have been reversed, as Hawaii has put together a successful month of April, while the Hornets roll into town losers of their last six games. "I think we have a good frame of mind that we've got to take this game seriously," Watanabe said. "We're not thinking of how we've done in the past, but are looking at the future." 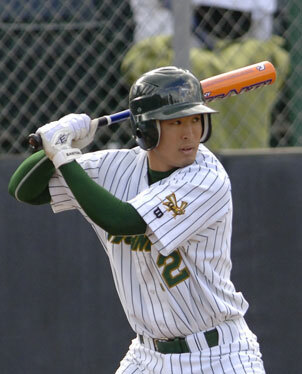 Watanabe was a first-team, all-state standout his senior season at Aiea, while Tanigawa was a top-level catcher at Moanalua. They knew of each other, but never spoke, until meeting up as freshmen at Sacramento State. The occasional high school taunt may fly back and forth between the two, but for Watanabe, it's hard to give Tanigawa a hard time about anything due to his personality. "Everyone considers him the nicest guy on the team," Watanabe said. "He always has that happy-go-lucky feeling. He has that vibe that comes off of him and it kind of rubs off on everyone." Sacramento State coach John Smith echos the same sentiments, but is also quick to heap praise on Watanabe as well. "Both of them are just outstanding young men with a high degree of character," Smith said. "Not one time has either one of them caused any problems in the five years they have been in the program. They have done a nice job in leading the way for our younger guys." The one struggle both players have had in their careers has been injuries. Watanabe was fortunate enough to stay healthy throughout high school, but has been battling pain in his arm since his freshman year. He had shoulder problems going into his sophomore season and surgery on his labrum prior to his junior campaign. "This is the only year I've actually been pretty healthy," Watanabe said. "It was kind of bothering me a little bit after last game, but it's nothing serious. It's not how it was before." Watanabe led the team with a .314 average as a freshman and earned the starting second base spot midway through the season. He has struggled since then, but is putting together a solid senior season, batting .307 with 23 hits and 16 runs scored while hitting primarily in the leadoff role when starting. He's been forced to split time at second all season as part of a rotation with junior college transfer Hunter Martinez, but isn't bothered by it as long as the team is winning. "This team is very special and I want to see how far we can take it," Watanabe said. "Playing time is something I strive for, but if the team is doing well with another guy in, I couldn't be more happy." The importance of winning is the same for Tanigawa, who has also been bit by the injury bug. Arm problems have resulted in just four starts for Tanigawa, who had 16 starts behind the plate as a junior. Tanigawa had elbow surgery as a sophomore and has felt lingering pain in the same area this season. Coupled with soreness in his throwing shoulder, which is twice as bad for a catcher, it hasn't been the statistical year he hoped for. "It's disappointing in the fact that I haven't been healthy, but nothing else," Tanigawa said. "I enjoy being with the team watching some good baseball games. I wouldn't miss this for anything." The injuries haven't changed the fact that Tanigawa has been one of the most inspirational players under Smith, who is on the verge of wrapping up his 30th season at the helm. "Brett is one of the most improved players that I've ever had in our program," Smith said. "I'm very proud of what both of them have been able to accomplish."